Kids love using go karts to explore the outdoors and ride in style. Available in a broad range of configurations, it can seem difficult finding the right one for your child. Our article is going to review some of the best go karts for kids. Each review will cover the product’s main features and any technical details that we can find. 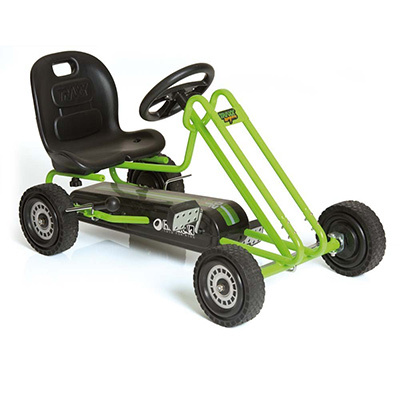 Our main criteria for selecting these go karts were users’ opinions, price and user-friendliness. 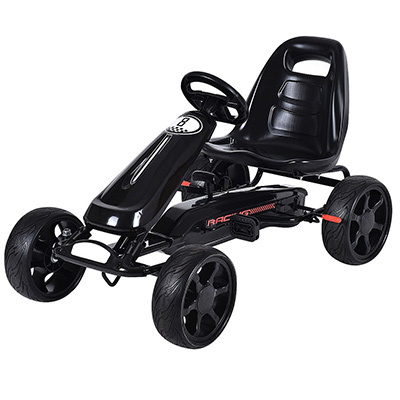 The Hauck Highlander has many features that helped it earn its spot on our best go kart for kids list. For starters, this product has a 3-point steering system that offers responsive maneuvering that is ideal for small kids. 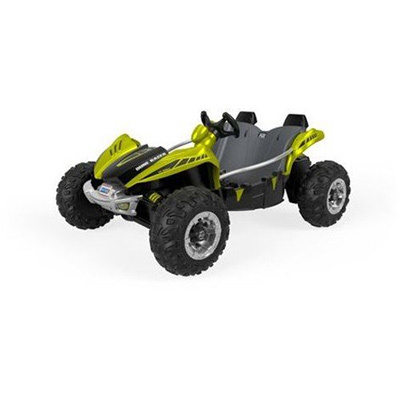 The large 12-inch tires also help the go kart to move through soft terrain quickly. Another nice feature is the adjustable bucket-style seating. Delivering a comfortable ride, this system also supports a broader range of user heights. When it comes to braking capability, the handbrake is conveniently located on the side for easy access. These safety features make the Hauck Highlander one of the best go karts for kids. The Fisher-Price Green Dune Racer is one of the few go kart-style devices that we could find that was electrically driven. Thanks to its efficient 12-volt battery and electric engine, this go kart can reach speeds of up to 5 mph. While not exceptionally fast, this is more than enough to delight little ones. The recommended age for this product is between three and seven years. As far as safety is concerned, this model comes with special metal handrails on each side of the jeep to help keep your children in place while they go on their own unique adventures. With a total weight of fewer than 20 pounds, this is one of the lighter go karts for kids. Falling into the category of budget-friendly, this is another model that utilizes pedal movement to propel it forward. Part of the reason for the lightweight design is the blend of high-quality Polypropylene plastic and metal that they use in the frame’s construction. We also like that the wheels have a special anti-slip groove etched into them. Offering more support and control across a wide range of terrain, this makes this a great choice for use in most home’s backyard area. 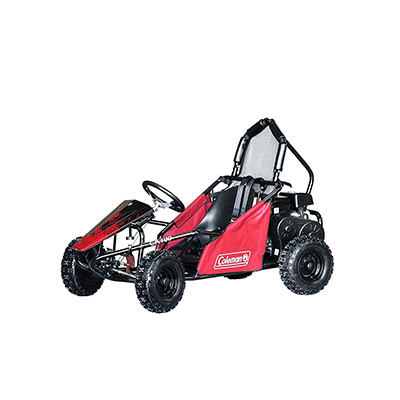 If your kid is a bit closer to to the teenager stage, you may want to check out the Coleman Powersports go kart. With a top speed of 25 mph, this is one of the fastest options on our list. It also happens to be the only gas model that we recommend for children as well. The small 3 HP engine is capable of delivering extreme amounts of power for its size. As far as frame construction goes, the majority of it is metal. With this in mind, this go kart is a bit on the heavier side. However, it’s also quite a bit more durable than many of the other options on our list, which makes one of the best go karts for kids if you are interested in a go kart that can take a lot of use. The Hauck Lightning is our number one kids go kart pick. Available in two different color choices, this is an excellent pick for both young boys and young girls. Just like the Hauck Highlander model, this product uses the same 3-point steering system that offers improved handling and performance. One thing that we really liked was the textured tire design. This offers a great deal more grip in loose terrain and is suitable for rocky terrains as well. In addition, the frame design is both durable and lightweight. Proper maintenance and care of your go kart are important regardless of the age it is designed for. The most important area to focus on is the engine and battery system. For gas go karts, you should pay careful attention to the required fuel type and make sure that it stays lubricated at all time. With electric go karts, the biggest thing to watch is the condition of your wires. In the event that the insulation is ever starting to crack, you should replace the cable as soon as possible with an approved part. In the case of many of these kids go karts, many of them are pedal driven. You should always remember to visually inspect the chain area at the base of the unit. When needed, apply an appropriate lubricant to prevent corrosion and ensure smooth operation. In addition, you should always inspect the frame for wear and tear before and after your child is done playing with it. In the event that you notice any cracks, it’s best to consult with the manufacturer to seek a certified repair option. 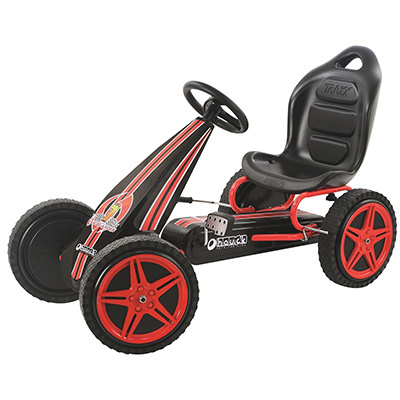 The products we recommended are all among the best go karts for kids. With a selection of products that is suitable for multiple age brackets, you should have no problem finding the perfect model for your little ones. You can also check out our picks for best pro stunt scooters, to see go kart alternatives for kids. If there is a go kart brand that you feel should be mentioned, please tell us about it below.